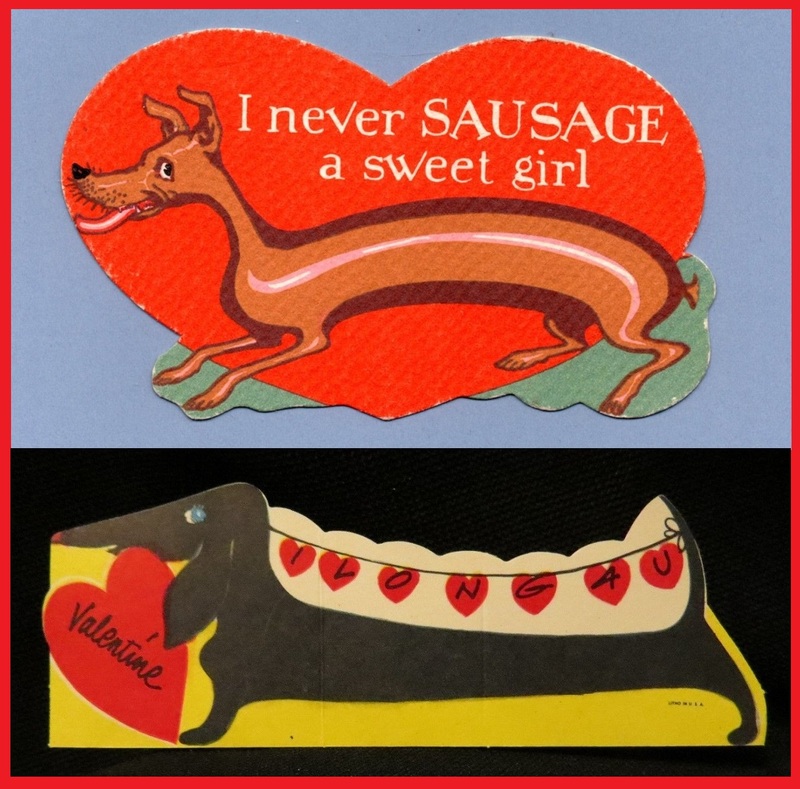 In grade school, come Valentine’s Day, no one was left out. Everyone got a valentine from everyone else. That is how I remember it. 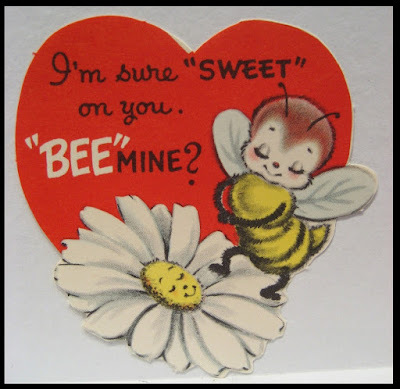 Each of us had a shoebox or any old box that we would decorate and bring to school, or maybe we did the decorating in school, and through a slot cut in the box we each dropped each other a valentine. 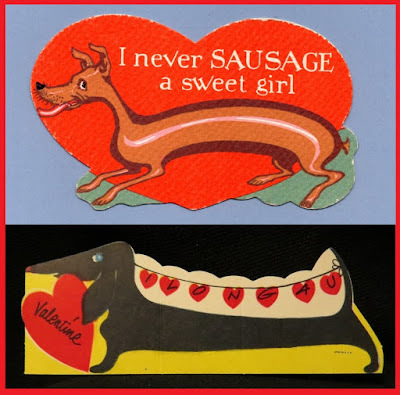 Maybe these valentine shoeboxes were kept on our desks, or lined up side-by-side on the windowsill, and surely a special time was set aside for valentine distribution, but then what? Did we open our valentines right then and there? Eat cupcakes with red icing? I do have a specific memory of one year making my valentine shoebox at home, sitting at the counter in the back room where we did such things, and then going through the pack of flimsy, colorful, cardboard valentines bought at Huerbinger’s Drugstore and choosing, with great thought, who would get which valentine. This was a punderous project that became even more so as I grew older, became nine or ten, then eleven, maybe because then there was a boy I particularly liked, and so a valentine card a pretty tricky business, having to choose his valentine. One had to be careful. Send the right message. 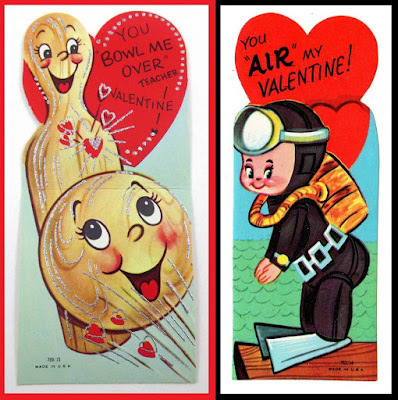 “You send me to the moon, Valentine!” says the little girl in the rocket ship. But maybe that’s too forward. Comes on too strong. But then again, why be meek? Kind of how I remember it, though I bought the ones for girls to send. Best friends got the best cards, of course, and those I didn’t much like got the worst. All the others got middlin’s. There may have been some effort to match card with personality, or impression of personality, and of course there was always one for teacher. She was so often the apple of one’s eye, or she deserved an “A+,” or something like that. The one on the left is for a teacher with patience to spare. The one on the right, see how deep my affection for you? The only thing I remember about the cards I received, which were, of course, pretty much like the ones I gave, is that one year I stared long and hard at a certain signature on the back of a certain card. Just a boy’s name scrawled in blue Bic pen. But I stared and stared. O tell me o ink, does he like me? Hits a home run! My heart doth flutter. One Valentine’s Day in college I got up really early and in the dark, dressed all in black, I distributed a bagful of cheap, punny valentines, anonymously, all across campus and off. I gave valentines to people that belonged to this group and valentines to people that belonged to that group. I gave them to people I knew and to people I did not know, and, feeling quite clever, I gave one to myself. 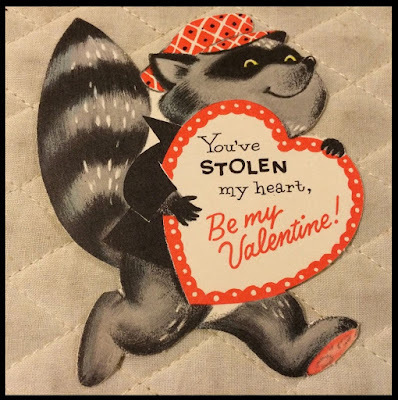 I was the Valentine Bandit. The maneuver was extensively researched, extremely well planned, and, I must admit, expertly carried out. I wish I still had that delivery map, but, of course, it had to be destroyed. 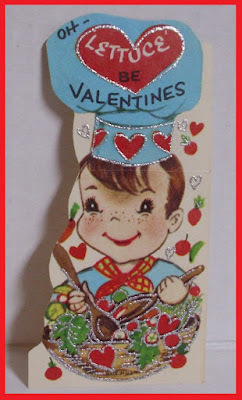 I can tell you this: no one ever knew who delivered all those valentines. No, I cannot mask my love for you. Another Valentine’s Day not long ago I sent an envelope full of classic punnytines to the man who was my heart’s desire. Ha ha ha! What folly! And where is he now? It was a mistake, of course, to put all my valentines in one envelope. But that being just a few years ago, I didn’t have to go to the drugstore for a pack of some modern-day love puns I probably wouldn’t understand, I just went online, to eBay, and so, lo and behold, I discovered: Vintage Valentine Pundemonium! I can still feel the excitement. 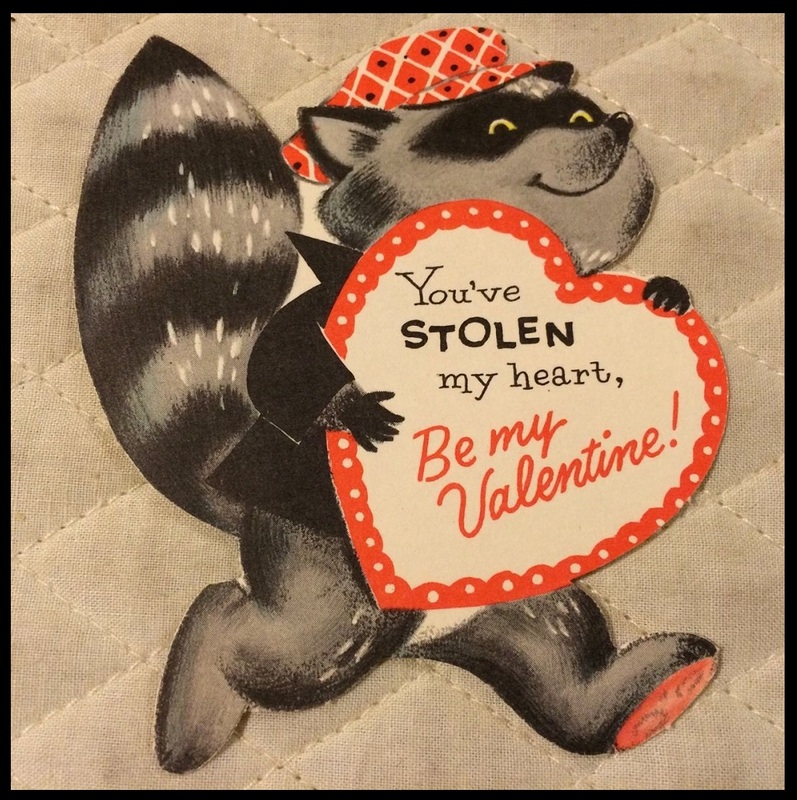 I got my stash of classic ’tines, sent them on their way, then realized Oh, I can just save this image as … And thus began my criminal digital vintage valentine collection. Two hot-diggetys from the long dog category. So now I steal valentines off eBay and keep them on my computer in a folder I call “valentines.” A couple of weeks ago, when I was feeling blue, just a slight off-kilter with the universe and all those unknowns, I stumbled across my valentine folder and began poking through it. My mood brightened. 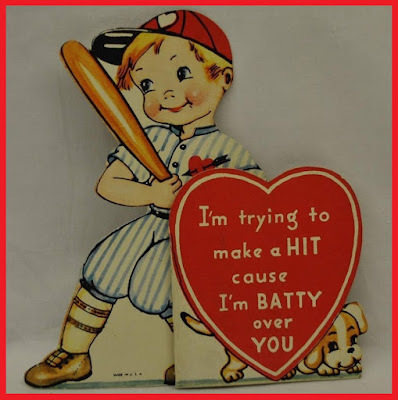 I began posting a valentine a day to Facebook. I got back on eBay and found some new vintage gems. And every time I thought I was getting tired of the whole thing, along came a new pun or drawing or something that made me laugh, or I revisited an old pun and smiled anew, and so it kind of became my daily shtick, and then I remembered this stuff about the valentine shoebox in grade school, and the Valentine Bandit in college, and this guy not so long ago, and gee, I thought, what’s with these silly old valentines? —If you don’t have one, then everyone is your valentine.